A while ago, when inspired the the idea of an apple pie with cheddar cheese, I created the caramelized apple and cheddar omelette which was an amazing combination of sweet and savoury. 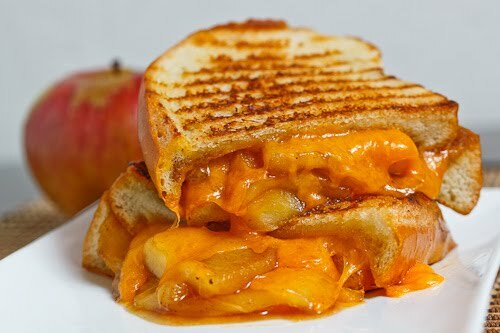 While I was enjoying it, I thought that grilled cheese sandwiches are also a good vehicle for the sweet and savoury combination and that I would have to try a caramelized apple grilled cheese sandwich. For all intents and purposes this is essentially an apple pie grilled cheese sandwich and how can you go wrong with sweet apples covered in warm melted ooey, gooey cheese? The caramelized apple grilled cheese sandwich turned out just as well as I had hoped, which is to say that it is addictively good and I have already made it more than a few times! The warm caramel coated apples with a hint of cinnamon go so well with the strong, melted cheddar cheese and the toasted crispy and buttery bread wraps it all up perfectly. Make sure to spoon any caramel sauce left in the pan after cooking the apple into the sandwich before closing it off and grilling it up. Assemble sandwich and grill until golden brown on both sides, about 2-4 minutes per side. Looks like an awesome combo! that looks excellent Kevin. I will definitely want to try it….so many of your recipes I want to try….LOL!!! I think this is the first time there's been anything on this site that didn't sound delicious. Now, that is a grilled cheese sandwich-delicious! OMG. That looks like the Grilled Cheese to end all Grilled Cheese. A sandwich to dream about. How have you never ever heard of apple+cheddar? Don't knock it 'til you try it :]! I first had apple and cheddar in a crepe in the MIT dining hall. I've loved the combination ever since, but it never occurred to me to put apples into my grilled cheese. Thank you so much for the idea, I'll definitely be trying it out sometime! Oh Kevin! You do know the way to my heart! You did a few crazy things here. First you said caramelized. Then apple pie. Then grilled cheese. And then. I fell in love. This looks amazing! I always knew this in my heart, but now I'm gonna say it out loud .. Kevin, u are the KING of grilled cheese sandwiches! Your combos are to die for! It's like a piece of apple pie with a slice of cheddar cheese…but on a sandwich! I always loved that combo! That is a serious grilled cheese. Looks amazing! This sandwich looks INCREDIBLE! I will have to make this at some point this week :). Brilliant inspiration – I'm definitely trying this soon (with all credit to you, of course!). BTW, I'm doing the Grilled Cheese Pageant again this year! Apples and Cheese are delicious together! I might have to make this for lunch today… I am so hungry! I just realized that I've been up for almost 3 hours and haven't really eaten anything yet! i had something like this just recently at a restaurant. it was amazing, but yours looks like it might be a bit better! apples and cheese are a classic combo! Kevin this looks insane! That picture is drool-worthy. I can't wait to make this for my brother and his friends- theyll go crazy!! My goodness, gracious! How decadent and melty and wonderful. 🙂 I think I may even take it up a notch with some bacon. 🙂 YUM!!! The combination of those flavors sounds interesting. I'll have to try it. I love grilled cheese with a touch of sweet. I've added fresh apples but never caramelized — thanks for the idea! The cheese and apple combination is one that will never get old! I have never had cheese and apples together but everyone says how fabulous it is and from the looks of your picture I think I would have to agree. brilliant. i can't wait to try this. WOW! this brings grilled cheese to an entirely new level! So, I like apples and cheese together. But cheese and caramel? I really don't know that I'm feeling that. So I'll just have to take your word that it was good. YOU, SIR, ARE A UTTER AND TOTAL GENIUS. yum! what kind of bread did you use? looks delish – I love apples & cheese! @ screwdestiny – caramel and caremlized are not the same thing. I love the combo of apples and cheese. This looks like an amazing sandwich… Thanks for sharing! Kevin – I made this sandwich today and it is PHENOMENAL! Caramelized apples + melted sharp cheddar just might be my new favorite sandwich ingredient combo :). what a great idea: i love cheddar apple pie but I'd never have thought of combining them for a sandwich… i will definitely try that! Wow! I went to Le Cordon Bleu and they never taught us the kind of things I'm learning from people like you! That sandwich looks amazing!! I absolutely love grilled cheese (I'm a kid at heart) but I never thought of trying it like that! I can't wait to see more of your recipes!!! great combo. reminds me of when i used to put apple butter on my grilled ham and cheese sandwiches. Yum! I haven ever heard of cheddar and apples before, but I couldn't resist trying this on your recommendation. Incredible! Thank you so much, Kevin! Hi Kevin!!!! This looks AMAZING! I am a HUGE fan of grilled cheese (one of my fav comfort foods). Love this take on it! What kind of bread did you use, and when you say good cheddar, is block cheddar ok, or deli-style? Can I just say…my friend and I made this about two months ago, and we CANNOT STOP TALKING ABOUT IT. We dream about it. We sing about it. We just love love love this sandwich. You are a genius. You have made me rethink New Englanders penchange for putting cheddar on apple pie. So, thanks. This was the most amazing sandwich I have ever had!!!!! I will be making it for everyone. But mostly myself. Absolutely delicious 🙂 I made it just now! Nice stuff Kevin! First I was looking at your Eggplant parm recipe which is the layered kind I love. And then I saw a picture for this! I will be making this for lunch tomorrow! I had a similar sammie in a restaurant recently and it was perfect! I'll be back! I just made this for lunch, I didn't add any sugar and caramelized some sweet onion with the apples. OMG to die! just tried this recipe!! i've never had the apple + cheddar combo but i decided to try it today since i was strapped for a lunchtime option and had a bunch of apples lying around. i added some caramelized onions to mine as well! ABSOLUTELY DELICIOUS. Selena: Caramelized onions would be a great addition! Glad you enjoyed the sandwich! I made this tonight and it is TO.DIE.FOR. One whole apple was kind of a lot, but I just ate the extra apple slices after I cooked them, so yummy :). Stumbled on this site last night by accident, looking for another recipe from FOODILY. Found this caramelized apple, grilled cheese sandwich recipe and couldn't resist. Came home for lunch today, grabbed an apple off the tree, sliced some of my special cheddar and discovered my new favorite sandwich…. Wish I had seen the suggestions about caramelizing some onions with the apples beforehand. Oh well, guess I’ll have to make it again tomorrow. Stumbled on this site last night by accident, looking for another recipe from FOODILY. Found this caramelized apple, grilled cheese sandwich recipe and couldn’t resist. Came home for lunch today, grabbed an apple off the tree, sliced some of my special cheddar and discovered my new favorite sandwich…. Wish I had seen the suggestions about caramelizing some onions with the apples beforehand. Oh well, guess I’ll have to make it again tomorrow. Kevin, just found your site this AM-shame on me. Have been sitting at this computer since 0830, it's now 1700 and time to feed my kittens. Thank you for an amazing time! This is my go-to sandwich. Soooo good, perfect flavor combo. I use a slice of American if I'm in a rush and don't have anything better in the fridge, but using a really nice sharp aged cheddar in this really takes it over the edge. Whoa! I would have never have thought of putting cheese in my apple pie. But what more of this?!?! I'll have to post this on my blog http://www.whatwich.com soon. This is really interesting! New fan, just signed up for your recipe box but have been searching several recipes yet am unable to find the little blue "save recipe" button. Sandra Gustchen: On this recipe it's just below the recipe title and before the Ingredients. If you are not seeing it can you tell me what browser and device you are using so that I can test and see what's wrong. Thanks!